Swiss Cup Disentis - European Cup Overall: Top 2! Wow, what a sucession of 2 weekends: with round number 4 of the Swiss Cup in Disentis and the European Cup final in Châtel back-to-back. The race weekends had it all: sun, dust, clouds, rain, mud (a palette from sticky clay to dirty water), stormy winds, sleet and even snow! European DH Cup Châtel (and overall European Cup): Châtel was round 6 and the final round for the European Cup. Whilst I didn't take part in all of the races, with the great results of Todtnau (1st) and Leogang (2nd) I started in position number two... Can you say, hello athlete's pressure?!? ;-) Arriving late Friday night I did not get the chance to practice a lot - on Saturday morning it took almost an hour to battle the French way of bureaucratism and get my number plate, parking admittance, extra insurance and shower entry pass... I did the most out of the sparse practice time I had left and enjoyed the course. Due to heavy rain it was very slippery and I was glad I had mounted mud tires. Little did we know that we were in for another downpour. 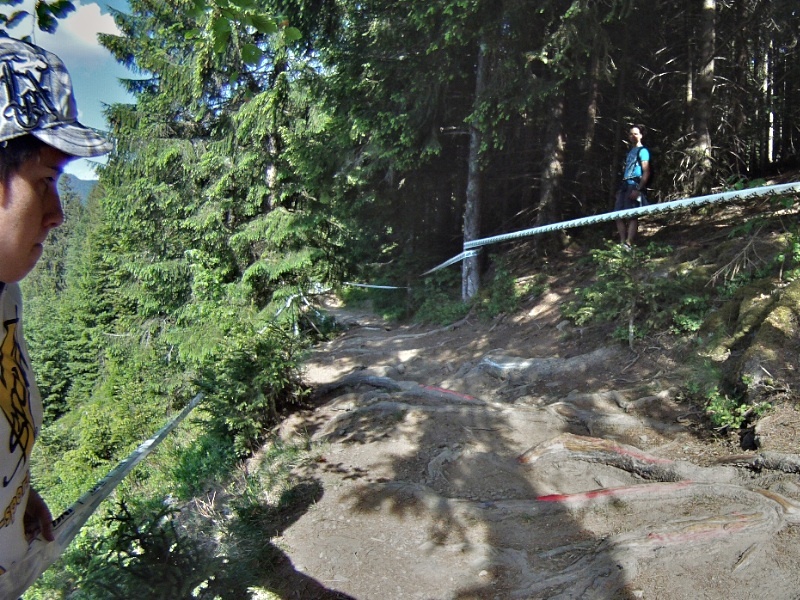 By the time our qualification started, the course had turned into a mudslide. It caught me completely off guard and hence I fought my way down and along the course. It was so slippery, that when you went off your bike you couldn't stand it back up without sliding away - quite like on ice! For Sunday's race we even got snow! Due to last minute gear complications I had to rush to the start and was already worn out before I started. 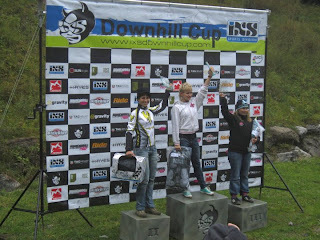 In a slightly less slippery course I ran 45s fastern than the day before - but not as fast as my competition. The 5th place was the result. But I wasn't really interested in the race placing but the overall ranking - I knew I only had to get a safe run in and it worked! In the final cup standings I was still 2nd! 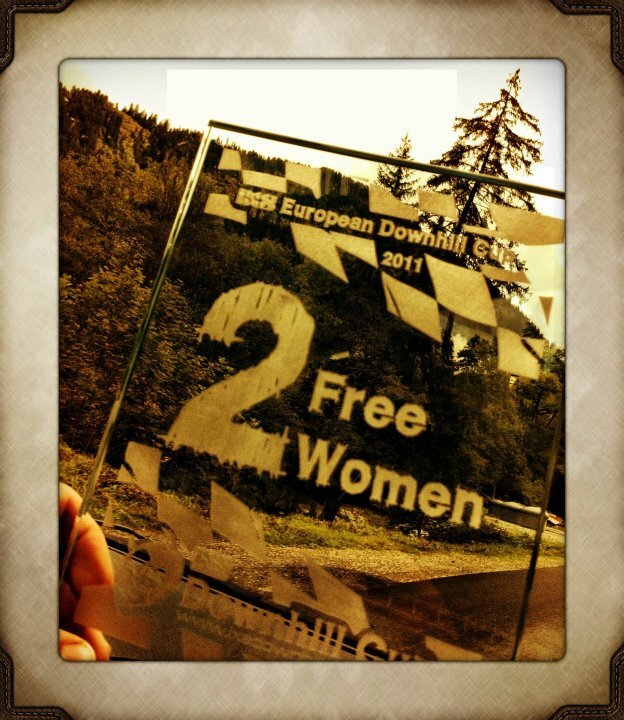 Wow, for a "I'll just try the Eurocup once this year"-plan I originally had this is a lot more than I had aimed for! More pictures of the race can be found here. Sorry for the lack of updates. Race season is in full swing and it is hard to keep up with the washing between coming home Sunday evening and packing Thursday evening. I also took a much needed vacation break in the flatlands - and now I'm eager and anxcious to get back to racing. The two races that passed in the meantime were the Flims Trailfox (a freeride rallye) and my first race of the Swiss DH Cup in Wierihorn, Berne. Still in good 2nd position at the start of the last race. In the Trailfox I started strong in the first three races but dropped from the 3rd to the inglorious 5th on the last race. The big bike had been a plus on the first days - but in such a long race with lots of flat and uphill sections it was the killer! 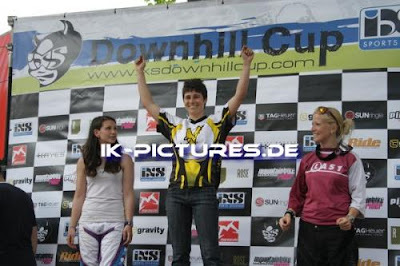 After the Trailfox I started in Wierihorn at the Swiss Cup. Unfortunately we had a sunny Friday but downpours on Saturday night and heavy fog on Sunday forced the organizers to let the Qualification run count as final result. I am glad I had some sunny time on Saturday morning to ride but was not very happy as I had needed a lot of time to dial myself in on the course. I hope next race will be better! 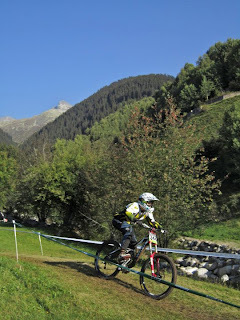 This weekend the Swiss Cup continues in Anzère - after the 5 weeks off I can't wait! The last two weekends were filled with races back-to-back. First stop was Leogang Austria for the third round of the European Downhill Cup. Since it is a fair way from home and I had never seen the course I chose to take the Friday off to make the most of the training. It was a good decision because it had rained the past days and the course was very muddy. The Worldcup the weekend before on the same track had completely bombed the course and it was rough even on the dry Friday. It was the muddiest course I had ever seen in my entire biking history! Saturday it stormed and rained: and the track got even muddier – and stickier as the rain let up. 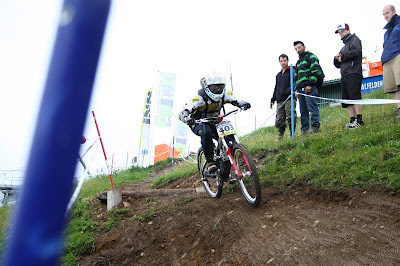 In the qualifications I did not hit the lines I wanted and got blown off my bike because I hadn’t seen a hole. So on Sunday I started in 4th position and with an almost perfect run took home 2nd place behind Victoria Zamalieva from Russia. Once again I am very happy. With this result I am still barely in position 1 overall. Now the Cup will move to the Czech Republic and Italy without me - so I will gain no more points and fall behind. 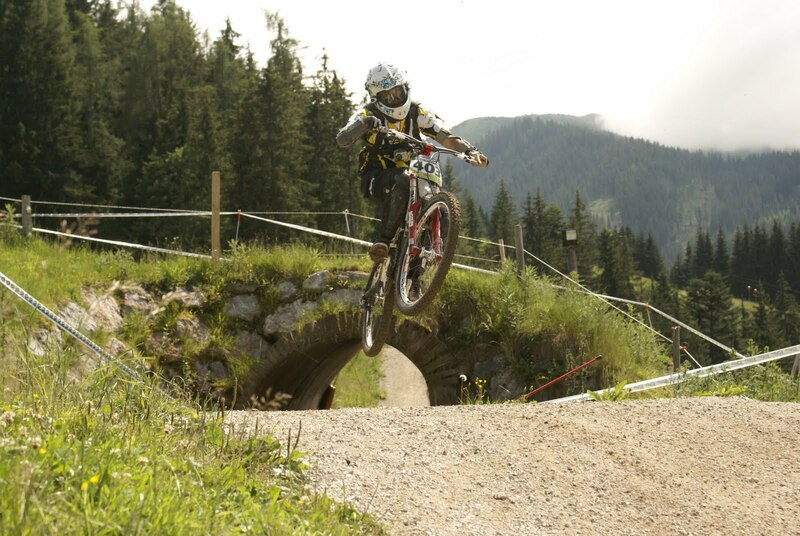 But I'm looking forward to the final round in Châtel, France. There I will try my best to get another good result for the books! Wow, it's here! Today I got to pick up my Trek Session 8. The generous support of both V-sport.ch and Trek made this possible. I am one happy camper! Still need to make some minor adjustments (like change the springs in the fork) and attach some pedals, but then we are ready to roll on Thursday. No illusions: I will need some time to "break it in" and get it dialled to fit my riding. 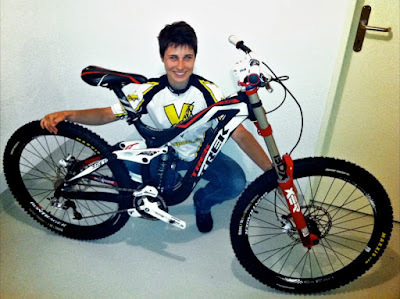 But I have until mid June, when this baby is coming to Leogang! This proves once again: nothing is impossible, all you need to do is ask. And put in some hard work and personal effort. But it sure paid off!! Thank you once again for your support! Now I still need is a catchy name. Suggestions? I knew right from start that the European Cup Venue Nr. 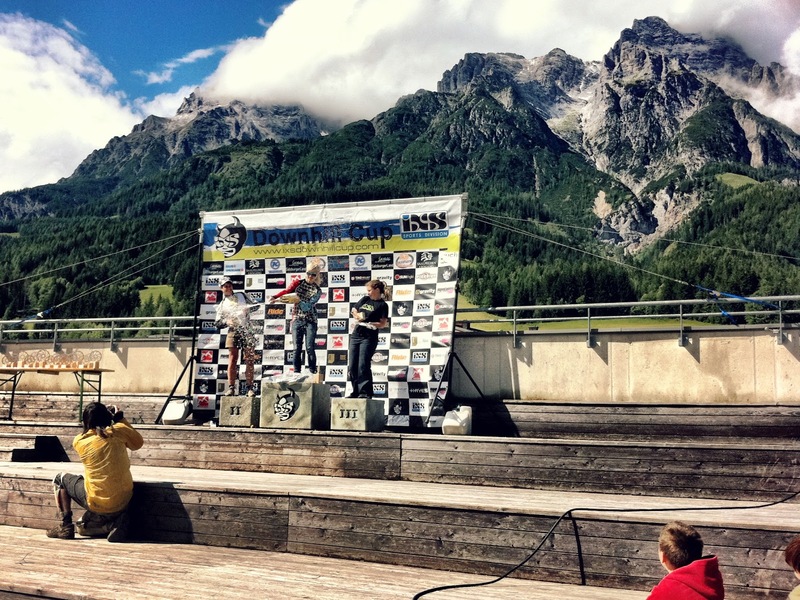 2 in Todtnau was going to be tough: techy, unknown course, little time to practice and a rainy forecast. As an unlicensed rider who needs to work on Friday before the race weekend I get a total of 3hrs on Saturday and 2hrs on Sunday to familiarize with the course. That amounts to 6-10 runs, depending on how fast the line is and how bumpy the course. Because if it is to rough, you can just not take more than 2-3 full out runs before a race run. So I felt I came at least mentally prepared. Nonetheless I found myself on the starting line for training on Saturday scratching my head and wondering where the chicken line (= the detour for the scaredy-cats). was. 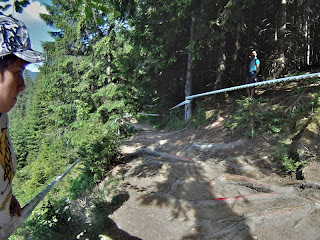 As I picked through the race line one run after the other I was slow to "warm up" to the course - lots of jumps and very rough root traverses were getting the best of me, almost bouncing me off. And the final bit included a very juicy climb! But until the practice time was up I had successfully managed to pick some sort of way through the whole course without the missing chicken lines. 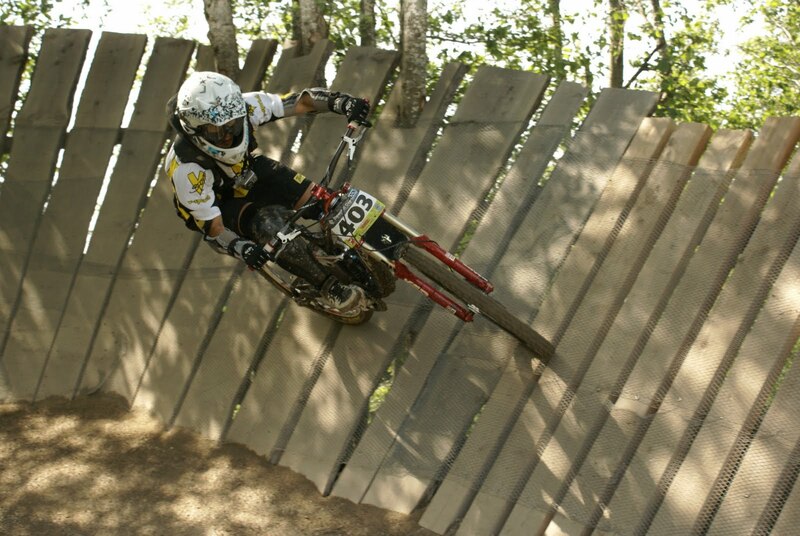 Just after noon I was the third rider to go into the track for the qualification run. I messed up in 2-3 places and having to pass a slower girl 2/3 into the course - hence I ended with the Nr.5 time in the category. After a shower I decided to walk alongside the course during the race to get more familiar with the lines and see how the Pros rode them. Sunday morning was an early call to get the most out of the short time available for a last practice. After fixing a wobbly headset the night before I was finding myself fighting a loose axle and was not happy with the 3 runs I got in, but eager to top it off with a good race. 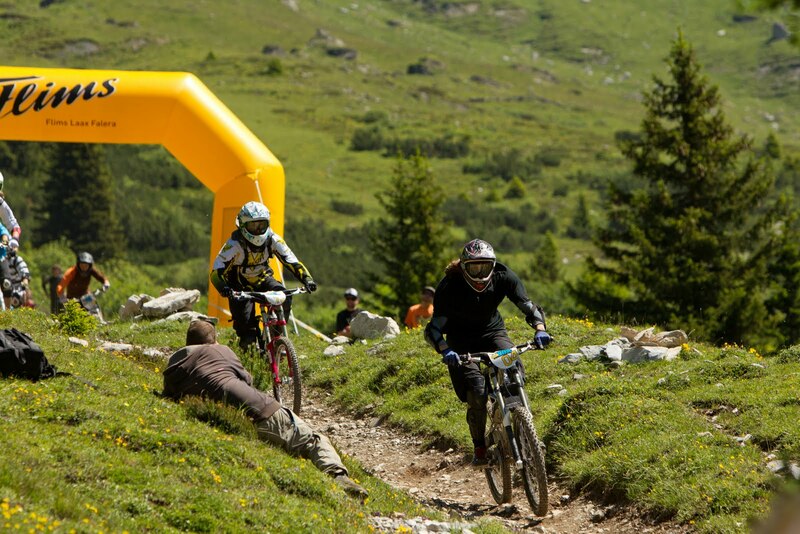 The race order is determined by the qualification times with the slowest rider starting first. Unfortunately that meant with my bad time I had to start after a very much slower rider again and pass her somewhere along. I tried to focus on the race line and not think about where and how to pass her and everything seemed to work as planned. I came up behind her in the lower third and called out very early, but she wouldn't pull to the side before the technical section and ended up falling right between a big drop and I had about two wheel wides to her side to avoid colliding. Then I was off to crank out all that was left on the last uphill and roll into the finish area as the first. I looked a time of 5:27 which was 3s faster than the qualification's category best. Now I sat in the Red Bull seat trying to regain my breath and watch the other riders come in and beat my time... but one after the other came in just slightly behind. Wow, that meant I was the winner?!? The speaker seemed kind of confused too and mistaked me for another rider, but the time-keepers ran out with a black-and-white proof that I had managed to get my first win in. For me it's not just "a" win. Since it was a European outing, my first race abroad and I did manage to set the best category time I was very proud - and hungry for more! 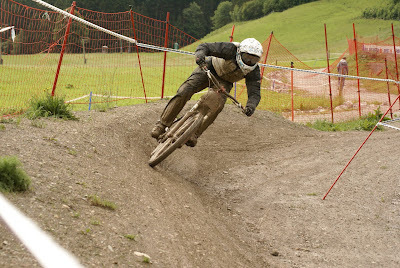 In consequence I will be at the third European venue in Leogang and try to replicate what worked and avoid what didn't. ;-) Let's see how it goes! Wow!!! I did it, first win of the season. And at the European DH Cup! I will post in detail later, now it's time to celebrate! 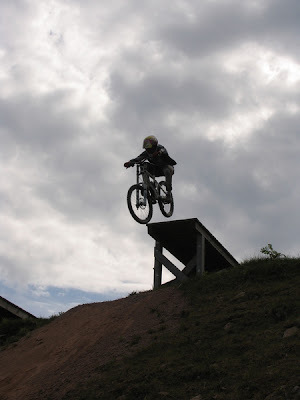 Today I learned to drop properly in the bikepark of Lac Blanc. What an awesome feeling once you get over the fear and the HUGE urge to pull on the brakes just before you go over the edge! It is amazing how smooth you can land even off of one-man heights. Completely different from jumping the same heights on foot. Now I understand why someone started to build such things. It's exhilirating because your mind screams at you "That isn't possible." as you fly out and then you hardly feel it when you touch back onto the ground. Wow, just Wow. Thanks Pippo, for leading me into the lines! !